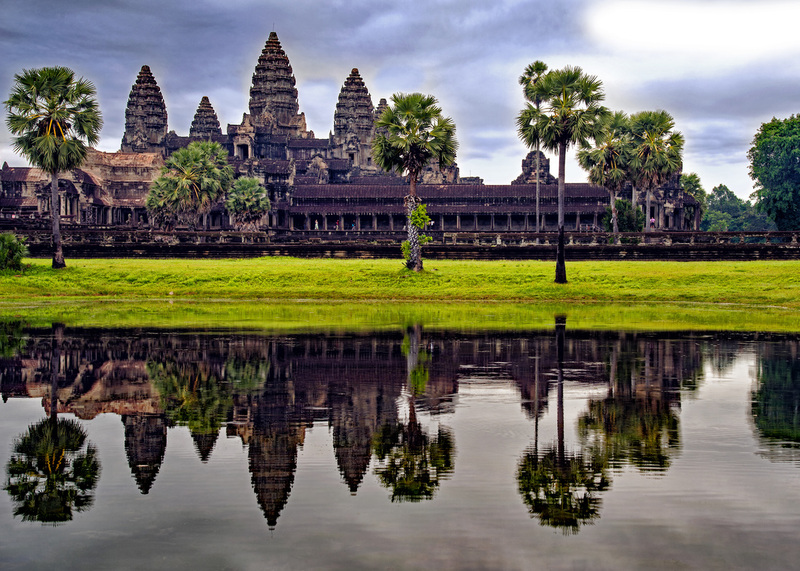 The iconic Angkor Wat is by far the best known and most visited ancient temple complex in Cambodia. Constructed in the 12th century as a temple dedicated to the worship of the Hindu deity Vishnu, it is considered to be the largest religious monument ever built. 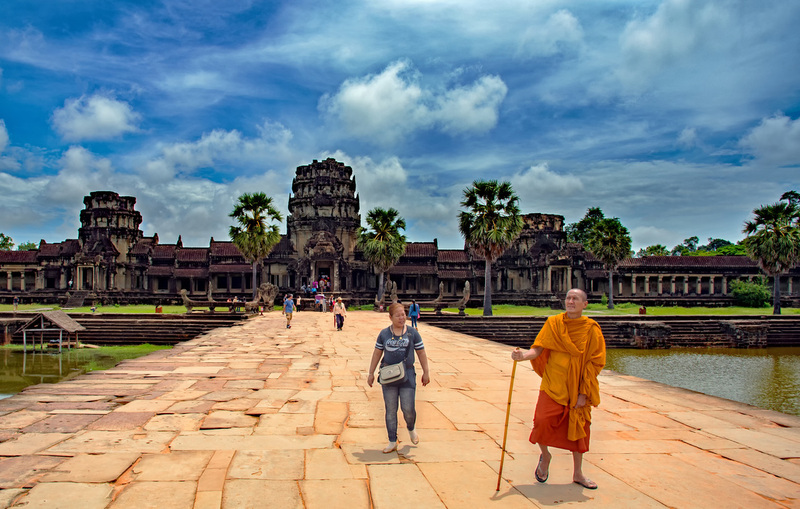 However, Angkor Wat, a former royal capital of the Khmer Kingdom, is only one of over 200 sites that make up the Angkor Archaeological Park, a UNESCO World heritage site. Considered to be one of Southeast Asia’s most important archaeological sites, it covers an area over 154 square miles (400 km2) and attracts over two million visitors per year. Since the “rediscovery” of Angkor by the French explorer Henri Mouhot in the 1850’s, countless books, articles and documentaries have been produced about these fascinating ruins. Therefore, in this webpage we will concentrate on the logistics of touring the temples and provide travelers with practical tips based on our many visits to Angkor. We strongly recommend that visitors purchase a good guide book and do some research on Angkor before arriving at the temples. For the past several years we have been using the Kindle version of Cambodia Revealed: The Temples of Angkor a guide book published by Approach Guides. This excellent book provides a wealth of information on the history of Angkor and the meaning of the reoccurring themes prevalent in Khmer artwork. It gives detailed site descriptions, maps and suggested routes for touring the most popular sites. The entrance to Angkor Wat is located just over four and a half miles (7 km) from Siem Reap’s tourism epicenter of Pub Street. But Angkor is the very southernmost point of the Archaeological Park; the other significant temples are scattered over an 11-square-mile (30 km2) area. The distance between the sites combined with Cambodia’s high heat and humidity make traveling the park on foot virtually impossible. Fortunately there are a number of transportation options available which range from bicycle rental, recommended only to those who are in good physical condition, to air-conditioned taxis and tour busses. A particularly popular and fun way to tour Angkor is by tuk tuk. In Cambodia these three-wheeled vehicles are essentially a two-wheeled cart attached and towed by a small motorcycle. The costs for transportation to and around the temples vary, depending on length of time and distance, but generally cost from $10 to $20 USD per day. Fares should be agreed upon in advance and are almost always negotiable, so don’t be shy to haggle a bit if the quoted price seems too high. Most hotels, hostels and guest houses have arrangements with particular drivers and will convince guests to book transportation with them. Depending on your negotiating skills, it may be slightly cheaper to seek out your own transportation. It is also possible to hire a tuk tuk or taxi for one-way trips to Angkor. This can save a few dollars, but will often require some patience to find a ride back to town, particularly during high season when the majority of drivers are already busy with round-trip passengers. It is important to note that drivers are not tour guides, will not enter the temples or provide much information besides the names of the sites. ​Admission tickets for the Archaeological Park are purchased at the newly built Angkor Ticketing office on Apsara road. Located roughly half way between Siem Reap town and Angkor Wat, this is the only place to buy tickets. The current admission prices are; $20 for one day, $40 for three days and $60 for a seven-day pass. Unfortunately, beginning in February 2017 ticket prices will be increased to; $37 for one day, $62 for three days and $72 for a seven-day pass. Visitor tickets are checked frequently; before entering the park and at each individual site. Do not lose your ticket; they are non-refundable. If lost during a multi-day visit you will be required to purchase a new one. Tickets purchased before 5:00 PM are punched, or used, on that same day. If you want to purchase tickets on the day before your visit, buy the ticket after five PM. The purchase of tickets after 5:00 PM will allow visitors one free sunset, as you may enter the park without having the ticket punched for that day. ​The majority of the Archaeological Park sites are open from 7:30 AM to 5:30 PM daily. However, there are a few exceptions; Angkor Wat and Srah Srang are open from 5:00 AM to 5:30 PM to allow for sunrise viewing. The temples of Pre Rup and Bakheng are open from 5:00 AM to 7:00 PM to allow visits at both sunrise and sunset. We recommend starting your visit to the park early in the morning before the tour buses arrive and the noonday sun cooks the ground below your feet. Catch the sunrise at Angkor and continue on from there. There are plenty of places to buy coffee and have breakfast within the walls of the massive temple complex. Frankly, morning coffee in the shadow of Angkor has become one of our favorite rituals. If you can stand the midday heat; the most visited sites often become deserted at high noon as visitors retreat from the ruins to find lunch and shade. Many people, including ourselves, avoid going to the park during the hottest times of day. Choose a hotel with a swimming pool and take a midday break from touring the temples. Midday is also a great time to visit the fully air-conditioned Angkor National Museum. This fantastic museum will give travelers a much deeper insight into the history of the Khmer Empire, its people and the fascinating temple complexes they left us. 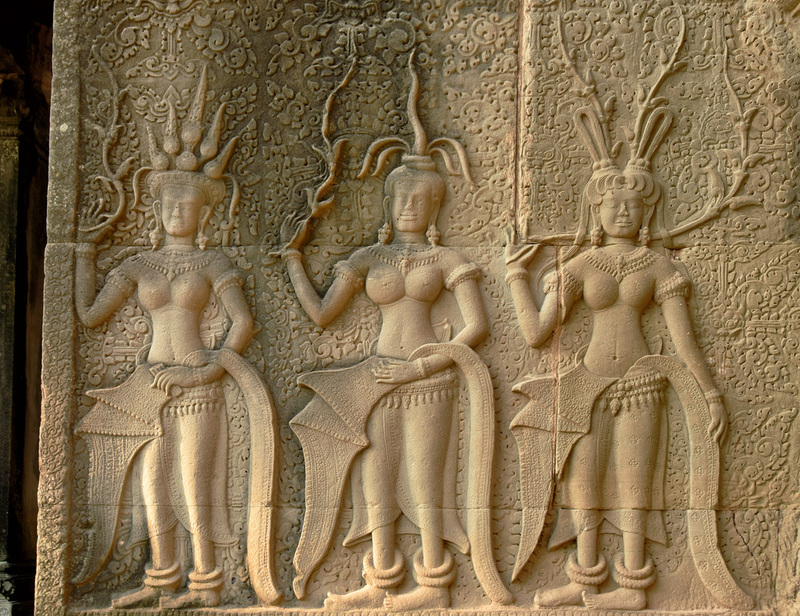 The museum’s quality exhibits go a long way into explaining the meaning of the temple’s architecture and reoccurring themes displayed in Angkor’s prolific artwork. Late afternoon, after 3:30 PM, is a good time to return to the park. As the sun approaches the horizon, its intensity decreases, the heat becomes less severe and the lighting less harsh, a boon for photographs. Catch the sunset at Bakheng and call it a day. 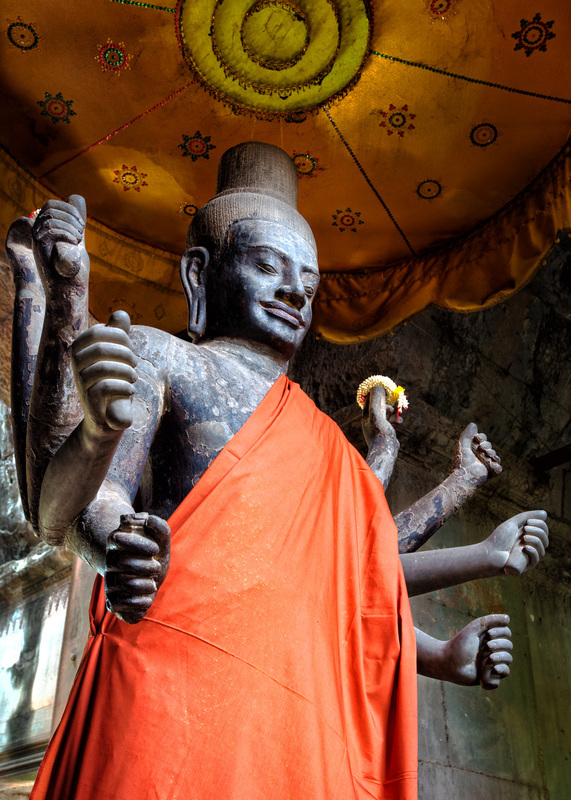 Visitors should be aware that the temples of Angkor are revered religious sites to many Hindus and Buddhists, particularly the Buddhist majority people of Cambodia. There are numerous working shrines tended by monks and nuns scattered throughout the park. 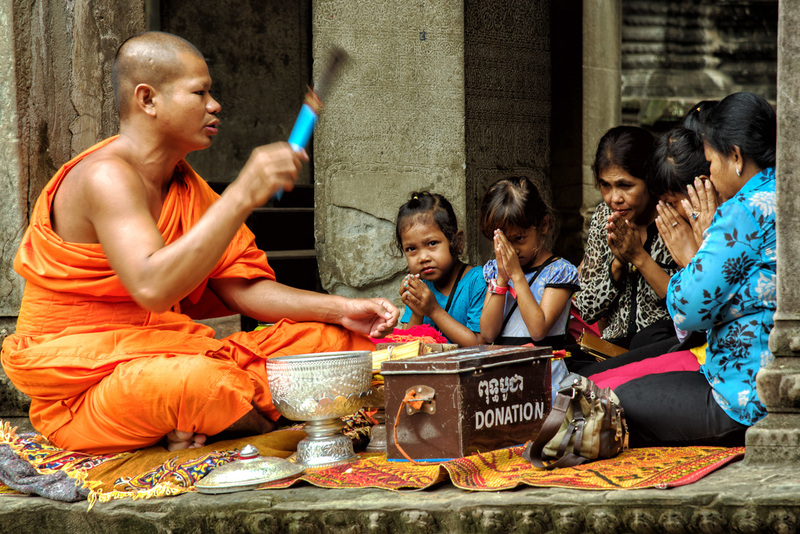 Guests are required to be respectful to the monks and worshippers. This includes adhering to a simple dress code which has only recently been enforced. Both men and women must keep the torso, shoulders and upper arms covered. Shorts and skirts must cover the knees, although the shorts that men typically wear these days, which break just at the knees, are acceptable. When in close proximity to a shrine it is customary to remove ones hat and shoes. Covering up a bit is probably a sensible thing to do anyway; touring the temples involves a good bit of walking under Cambodia’s merciless sun. Don’t forget to bring sun block, sunglasses and hats and to drink plenty of water.